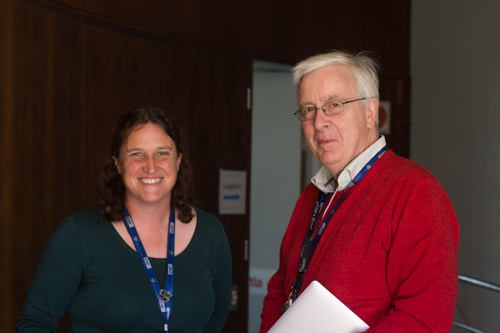 We were very fortunate to have Professor Robin Wood and Dr Keren Middelkoop, both from the Desmond Tutu HIV Foundation (DTHF), update us on the tuberculosis (TB) aerobiology project. The project aims to characterise how airborne TB infects people in different spaces. South Africa is one of the six countries globally with the highest rates of TB. The bacteria is responsible for the highest percentage of deaths among HIV-positive South Africans. Understanding how and where transmission occurs and improving the case finding process may help eradicate the bacteria. Wood summarised the progress made in measuring individual airborne TB bacteria. For this latest research by DTHC, each patient spent a short amount of time in an air-controlled kiosk. Clean air is pumped in, breathed by the patient, and captured. The team then analyse the air to see how the composition of the air has changed. For example, the carbon dioxide (CO2) levels should be higher due to exhalation. Each participant had TB, yet the kiosk identified just over 40% of participants as having TB. This result is useful, but indicates that less infectious cases of TB will be missed. Measuring airborne bacteria, like tuberculosis, is tricky because the number of bacteria in a large quantity of air might be very small. As a result, the team has been aiming to develop more sensitive gadgets that are less likely to miss organisms. The new device will allow the team to measure the exhaled breath directly, instead of collecting it in the kiosk. Wood believes this will improve the sensitivity of exhaled air measurements, as high airflow capture increases the chance of capturing individual TB bacterium and other organisms. Middelkoop presented a different component of the same project. She has been sampling air in communal spaces to see if TB is being transmitted. As Middelkoop explained, this is tricky and the project is currently in the ‘proof of concept’ stage. There is the potential to identify areas with a high risk of TB transmission and advise on how to reduce the risk. Air is sampled using a filter over a vacuum that traps small particles while letting air flow through. The team has completed over 70 air samples from TB clinic rooms as well as from empty, windy fields where the team doesn’t expect TB (as controls). The team has been able to identify TB form clinic spaces, even in the presence of measures to reduce TB transmission (such as opening doors and windows). TB levels in the air are expected to be higher in places where levels of CO2 (rebreathed air) are high. CO2 levels increase increase when lots of people share a space that isn’t ventilated, because everyone rebreathes the same air. Eventually, the team wants to go to communal spaces (such as churches, schools, etc) and quickly and reliably identify the presence of TB. If that space has no TB, then no one needs to be tested for active TB disease. However, if TB is found, then everyone can be tested and, if identified to have TB disease, treated quickly before the bacteria spreads. At the moment, active case finding of TB in communities is expensive and time-consuming, and therefore rarely done. If shown to be feasible, this method has the potential to increase the efficiency of screening and identify new cases before they infect more people. We wish Wood and Middelkoop the best of luck as they continue their valuable project, and thank them for an engaging presentation.